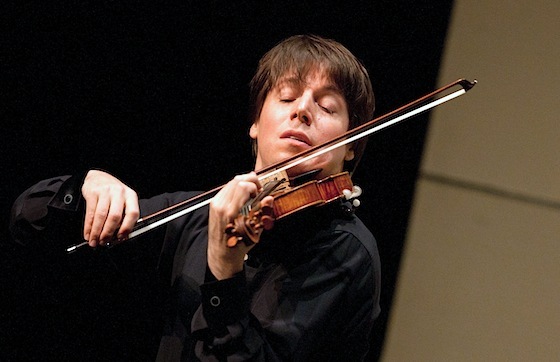 On Thursday, April 02, 2015, violinist Joshua Bell and pianist Sam Haywood performed a recital at the Moss Arts Center on the Virginia Tech campus. Anticipation for the recital was high in this college town, as poor weather forced cancellation of the original date fourteen months earlier. The sheer force of Bell’s energetic musicality worked its legendary magic and was richly complemented by Haywood’s elegant pianism. The recital opened with the Sonata No. 4 in A minor, Op. 23, by Beethoven, a piece that clearly celebrates the equal musical stature of the piano in the sonata genre. In Bell’s hands the ex-Huberman projected to rear of the hall with perfect clarity, its tone conveyed by the state-of-the-art acoustical design of VT’s new flagship venue. Bell varied the tonal colors of the many themes with great subtlety in both bowing and vibrato, offering many welcome lessons to the violin-playing observer! The Sonata No. 1 in F Major Op. 8 by Grieg demonstrated the craft of close ensemble collaboration, and a few of the more sentimental passages allowed Bell to indulge his romantic side. Bell and Haywood opened the second half with the familiar, comforting melodies of the Brahms Sonata No. 1 in G Major, Op. 78, which provided the intellectual center of the recital, and they finished with Bartok’s turbulent Rhapsody No. 1 sz. 87. An arrangement of Chopin’s C# Minor Nocturne for Piano and the lively Brahms Hungarian Dance No. 1 were performed as encores to a deeply appreciative southwestern Virginia audience. Even from the mezzanine, Bell's athletic gyrations convey the effort that he expends, but through my binoculars it was clear that both performers truly gave us their all. Recitals like these remind us why we need fine artists and beautiful venues in which to enjoy their work.